Boost Your Immunity, Brain Function & Overall Health with vitamin D. You naturally get Vitamin D when your skin is directly exposed to natural sunlight. However, most people don't get enough sun exposure, especially during cold winter months. 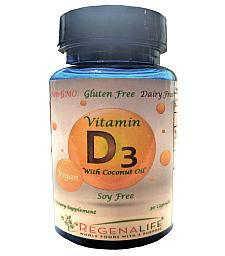 Vitamin D plays important roles throughout your body, so getting enough every day is vital to optimal health. The naturally fatty acids in coconut oil help transport the vitamin D to your bloodstream for faster, more effective health support. Every serving of one softgel provides you with 5,000 IU of vitamin D and 100mg of certified organic coconut oil. Vitamin D helps regulate immunity and brain function Provides support for new cell growth, stable moods, and more restorative sleep. Vitamin D Promotes optimal neuromuscular function and health.